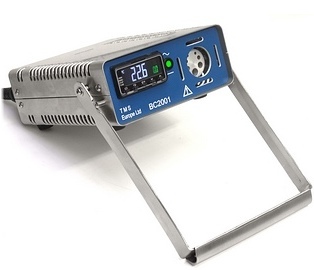 The BC2001 is a very compact, highly portable, block calibrator designed for checking the accuracy of temperature sensors and thermometers. It offers compact size, low cost, and yet high accuracy. This version features the default 'Block 1', a single fixed block with 7 wells for variety of common probe sizes (see datasheet for full details), for other variants and options please contact us for a price and lead-time. Carry Case: Hard moulded black plastic case with handle and shaped foam lining included in this kit as standard. The calibration of the block calibrator in 1 well at 3 temperatures: 60, 150 and 300°C at full and partial immersion, and 1 survey of all wells at 150°C. A UKAS (ISO 17025) calibration certificate listing results will be provided in the customer's name. Lead time is typically 6 to 10 days (on top of availability of the block calibrator). For calibration at different temperature points, additional survey points, in a specified well (or wells) or with different customer details on the certificate, please contact us for a price.